Nintendo Switch with Neon Blue and Neon Red Joy-Con. In addition to providing single and multiplayer thrills at home the Nintendo Switch system can be taken on the go so players can enjoy a full home console experience anytime anywhere. The mobility of a handheld is now added to the power of a home gaming system with unprecedented new play styles brought to life by the two Joy-Con controllers. At home the system rests in the Nintendo Switch dock which lets you play with family and friends on a TV in the comfort of your living room. By simply lifting Nintendo Switch from the dock at any time the system instantly transitions to handheld mode and the same great gaming experience that was being enjoyed at home now travels with you. The portability of Nintendo Switch is enhanced by its 6.2-inch screen which displays bright high-definition gameplay at the park on an airplane in a car or at a friend's apartment. Nintendo Switch comes with two Joy-Con that can each act as a standalone controller with an an This item cannot be shipped to APO/FPO addresses. Please accept our apologies. Nintendo Switch with Gray Joy-Con. In addition to providing single and multiplayer thrills at home the Nintendo Switch system can be taken on the go so players can enjoy a full home console experience anytime anywhere. The mobility of a handheld is now added to the power of a home gaming system with unprecedented new play styles brought to life by the two Joy-Con controllers. At home the system rests in the Nintendo Switch dock which lets you play with family and friends on a TV in the comfort of your living room. By simply lifting Nintendo Switch from the dock at any time the system instantly transitions to handheld mode and the same great gaming experience that was being enjoyed at home now travels with you. The portability of Nintendo Switch is enhanced by its 6.2-inch screen which displays bright high-definition gameplay at the park on an airplane in a car or at a friend's apartment. Nintendo Switch comes with two Joy-Con that can each act as a standalone controller with an analog stick a full This item cannot be shipped to APO/FPO addresses. Please accept our apologies. 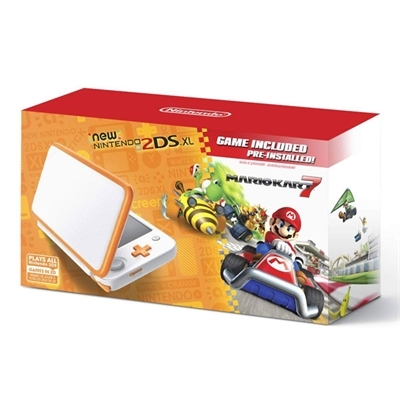 New Nintendo 2DS XL Orange and White with Mario Kart 7 Pre-installed. Step up to XL screens in a lightweight go-anywhere system. Gamers of all ages can play in style with the New Nintendo 2DS XL system. It gives you the power of the New Nintendo 3DS XL system in a streamlined affordable package and plays a huge library of games in 2D. Colorful accents add style while the sleek clamshell design makes it comfortable to hold. A fast processor offers short loading times so you can start playing in a snap. And its all in a lightweight play-anywhere package. The C Stick brings enhanced controls (like intuitive camera control) to compatible games while ZL and ZR buttons give you plenty of options. Tap an amiibo figure to the near-field communication (NFC) reader on the lower screen to enjoy amiibo features in compatible games. You can play all Nintendo 3DS New Nintendo 3DS and most Nintendo DS games in 2D on this system. This item cannot be shipped to APO/FPO addresses. Please accept our apologies. 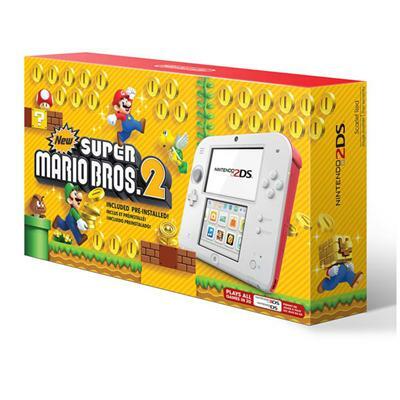 Nintendo 2DS Scarlet Red w/New Super Mario Bros. 2 (Game Pre-Installed). The Best of Two Worlds. The Nintendo 2DS system brings the power of two systems together into a single affordable package. Play all games both Nintendo DS and Nintendo 3DSin 2D. Connect with friends other players and wireless hotspots using the wireless StreetPass and SpotPass communication modes to unlock exclusive content for games and download other entertainment. From games to photos and beyond Nintendo 2DS is the ultimate 2D gaming experience. Nintendo 2DS is a 2D system that plays all Nintendo DS and Nintendo 3DS games. Nintendo 2DS is only capable of 2D display. This item cannot be shipped to APO/FPO addresses. Please accept our apologies. With the Nintendo Switch Dock set you can easily play the Nintendo Switch console in another room with a TV. Includes a Nintendo Switch Dock Nintendo Switch AC Adapter and High Speed HDMI an HDMI Cable. This item cannot be shipped to APO/FPO addresses. Please accept our apologies. 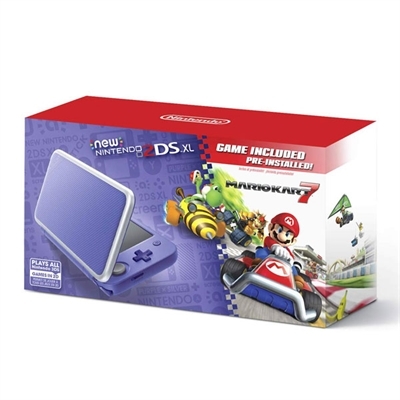 New Nintendo 2DS XL - Purple and Silver w/ Mario Kart Pre-installed.Step up to XL screens in a lightweight go-anywhere system. Gamers of all ages can play in style with the New Nintendo 2DS XL system. It gives you the power of the New Nintendo 3DS XL system in a streamlined affordable package and plays a huge library of games in 2D. Colorful accents add style while the sleek clamshell design makes it comfortable to hold. A fast processor offers short loading times so you can start playing in a snap. And its all in a lightweight play-anywhere package. The C Stick brings enhanced controls (like intuitive camera control) to compatible games while ZL and ZR buttons give you plenty of options. Tap an amiibo figure to the near-field communication (NFC) reader on the lower screen to enjoy amiibo features in compatible games. You can play all Nintendo 3DS New Nintendo 3DS and most Nintendo DS games in 2D on this system. This item cannot be shipped to APO/FPO addresses. Please accept our apologies. This bundle includes the Nintendo 2DS Super Mario Maker Edition system as well as the Super Mario Maker for Nintendo 3DS game pre-installed. Nintendo 2DS. The Best of Two Worlds. The Nintendo 2DS system brings the power of two systems together into a single affordable package. Play all games both Nintendo DS and Nintendo 3DS in 2D. Connect with friends other players and wireless hotspots using the wireless StreetPass and SpotPass communication modes to unlock exclusive content for games and download other entertainment. From games to photos and beyond Nintendo 2DS is the ultimate 2D gaming experience. Nintendo 2DS is a 2D system that plays Nintendo DS and Nintendo 3DS games. Nintendo 2DS is only capable of 2D display. This item cannot be shipped to APO/FPO addresses. Please accept our apologies. The Best of Two Worlds. 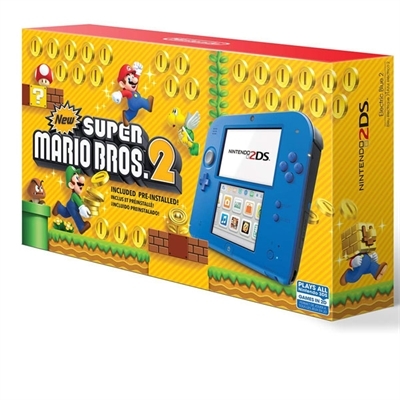 The Nintendo 2DS system brings the power of two systems together into a single affordable package. Play games both Nintendo DS and Nintendo 3DS in 2D. Connect with friends other players and wireless hotspots using the wireless StreetPass and SpotPass communication modes to unlock exclusive content for games and download other entertainment. This item cannot be shipped to APO/FPO addresses. Please accept our apologies. New Nintendo 2DS XL - Black + Turquoise w/ Mario Kart 7 Pre-installed. Step up to XL screens in a lightweight go-anywhere system. Gamers of all ages can play in style with the New Nintendo 2DS XL system. It gives you the power of the New Nintendo 3DS XL system in a streamlined affordable package and plays a huge library of games in 2D. Colorful accents add style while the sleek clamshell design makes it comfortable to hold. A fast processor offers short loading times so you can start playing in a snap. And its all in a lightweight play-anywhere package. The C Stick brings enhanced controls (like intuitive camera control) to compatible games while ZL and ZR buttons give you plenty of options. Tap an amiibo figure to the near-field communication (NFC) reader on the lower screen to enjoy amiibo features in compatible games. You can play all Nintendo 3DS New Nintendo 3DS and most Nintendo DS games in 2D on this system. This item cannot be shipped to APO/FPO addresses. Please accept our apologies.